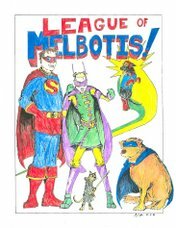 League of Melbotis: Blame Nicole. If there's no post this evening, you can blame Matt and Nicole. Mostly Matt. Or Nicole. As you may know, Matt and Nicole house sat for us this weekend, for which we are enormously grateful. And during that time, they watched some TV. Over the past three days, and a while this evening, I spent some time trying to figure out what was wrong with my TV. I don't know what those two crazy kids were up to, but they wreaked havoc on the aspect ratio on my TV and seemingly were bouncing it out of its HD-ness. The biggest problem was that we'd had that problem with the TV when we got it, and I knew I'd stumbled upon the solution a year ago while doing something completely unrelated. Anyhow, I finally figured it out (the issue was not with the TV or a setting thereupon, but in an option on the cable box remote of all the darned things). And I'm documenting here, so that when it happens again, I can possibly remember what I did and not lose untold hours tearing apart my AV set-up. (It's a display option in the "settings" on the cable remote, Future Ryan). So, yes, the Samsung manual was probably better than I thought, and I should not codemn it to a firey, firey fate in manual hell. That's only one of the things Matt "fixed" for you while you were away. I guess you haven't noticed yet, but on Saturday he sat at your table with a box of crayons and colored in every black and white comic that you own. In his defense, he mostly did a good job of staying between the lines (and who knew that Maus could benefit so much from the addition of neon pink and purple?). hey, you didn't see me complaining, did you...? I will point out, Jason actually started going down the path of looking at the cable remote a full hour before I considered it as a possibility (and just before I tried to rewire my entire AV set-up).